The post primaries crisis rocking the All Progressives Congress (APC) has no doubt attained a frightening dimension, with those involved digging deeper into the trenches and seeking to outdo one another in insult hurling and name calling. Pitched against each other are Comrade Adams Oshiomhole, National Chairman of the party, a former labour leader and two term governor on one side with three governors, Ibikunle Amosun of Ogun State, Rochas Okorocha of Imo State and Abdulaziz Yari of Zamfara State on the other side. The three governors are fully supported in the war of words against Oshiomhole by the governor of Ondo State, Rotimi Akeredolu, a lawyer and former President of the Nigeria Bar Association. The crisis has clearly exposed the fragile bond that binds the ruling party, making Nigerians see the party as an association of political players whose only common ground is attaining political power and not by any shred of ideology or the common good of the people. This is more evident as the crisis only borders on the failure of the state governors to have their ways in the choice of candidates for elective offices, especially governorship in the forthcoming 2019 general elections. The parties to the ‘war’ in the ruling party, while disregarding the potential harm that may be done to its chances in an election year, have remained resolute and adamant in their respective positions, despite interventions from the leader of the party, President Muhammadu Buhari. What is however interesting in the whole scenario is that these same governors were instrumental in the sack of former APC national chairman, Chief John Odigie-Oyegun, who many of them accused of being responsible for the crisis in the party when he was in charge. In his place, Oshiomhole was brought in to provide a new direction and also heal the many wounds in the party. The opposite seems to now be the case, as they are now calling for his head. 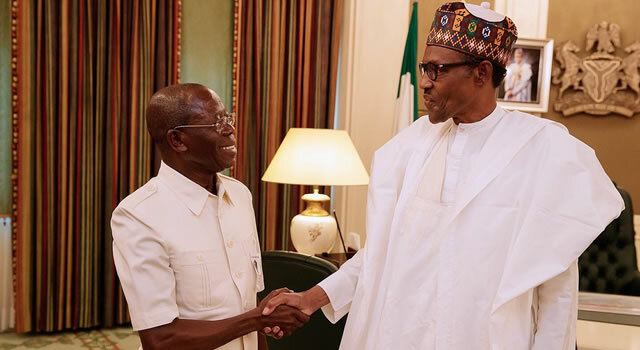 Aside Governor Akeredolu, who has been direct and blunt in calling for Oshiomhole’s sack, it has become common knowledge that several state governors on the platform of the party have been working behind the scenes to have Oshiomhole relieved of the position of national chairman. 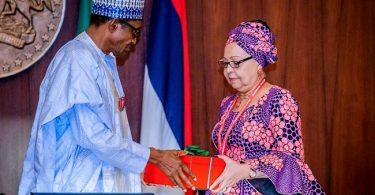 On the other hand, the former Edo State governor appears to enjoy the confidence of President Buhari, who appears not keen in interfering with the powers of the party’s National Working Committee (NWC). 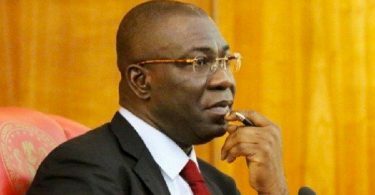 Apart from the President, majority of the senators from the party have also thrown their weight behind Oshiomhole, insisting that he cannot be removed. The support of the senators is understandable, as most of them have been at loggerheads with the governors, who most times behave like emperors, in the words of Oshiomhole, at their detriment. Analysts are however wondering why the ruling party have failed to learn from the mistakes made by the leadership of the Peoples Democratic Party (PDP) before the 2015 General elections that eventually led to its loss of power at the center. It would be recalled that the PDP was hit by a leadership crisis in 2014, with many governors and chieftains of the party calling for the removal of its then National Chairman, Alhaji Bamanga Tukur. Tukur was eventually eased out for Alhaji Adamu Muazu, but that was after the exodus from the party had started. The party never recovered from the crisis until the elections, which it lost. With the current crisis, it has become obvious that the chances of the APC will be affected in Ogun, Imo and Zamfara, no matter who ‘wins’ the ‘war’. This is aside potential loses in Kano, Delta and Lagos States, where issues relating to primaries and a sitting governor’s alleged bribery scandal may further contribute to electoral misfortune for the APC. The question has however been on the lips of many: who wins and who blinks? Will this current crisis undo the already slim chances of President Buhari’s second term bid or will the party be able to surmount the obvious rancour within its ranks and retain power in 2019? Can Comrade Oshiomhole, hold out against Amosun, Okorocha, Yari and Akeredolu? Can he retain his position as chairman and maintain his stance on governorship candidates from the affected states? It would be recalled that Oshiomhole, a man noted for his dexterity when it comes to verbal warfare, had described Amosun as behaving like an emperor and accused Okorocha of building a political dynasty, which he said would not be allowed in APC. The party chairman, all but called Okorocha a liar when the governor said the party, because of Oshiomhole, has lost about five million supporters or members, which literally translates to five million votes for the reelection bid of President Buhari. Oshiomhole’s off hand dismissal of Okorocha’s five million members, and by extension, voters, may be foolhardy for any party operative in Nigeria’s volatile and largely unstable political environment. This is because the reality on ground in the country shows that governors control more of the grassroot political environment much more than the President or those based in Abuja through their foot soldiers. To start with, a complete revolt by Amosun in Ogun State in the event that his preferred choice, Abdulkadir Akinlade is not given the ticket of APC, may adversely affect the chances of the President in the state. The same goes for Imo and Zamfara states, as injured Okorocha and Yari may not be willing to work for an outright APC victory in the state. The APC chances, and by extension votes for President Buhari In Zamfara will no doubt be affected as the Independent National Electoral Commission (INEC) has declared that the party will not present candidates in the coming elections. So, the situation with Yari is even more pathetic, as the governor, who doubles as the Chairman of Nigeria Governors Forum (NGF) may, if INEC stands its grounds, have none of his supporters and allies standing for the 2019 general elections, all because of the inability of operatives of the party to meet halfway. Closely related to this is the situation in Delta and Rivers States, where two factions are claiming the right to produce candidates for the 2018 elections. In Delta, where two sets of candidates emerged, a faction, led by Chief Cyril Ogbodo secured an order of an Asaba Federal High Court barring Oshiomhole and the NWC from submitting any name to INEC. The NWC, in its wisdom, however submitted the names of Chief Great Ogboru and others belonging to the Prophet Jones Erue faction, an action that led to the filing of contempt charges against Oshiomhole by the Ogbodo faction. If the Delta situation is not properly handled, the state may also contribute to the five million voters or members Okorocha talked about. In Rivers State, the situation is much more confusing, as the Supreme Court has nullified all the ward, local government and state congresses held in the state to produce officials for the party. The effect of this is the fact that the primary election that produced Mr. Tonye Cole as the governorship candidate of the APC in the state was an exercise in futility. The two factions in the state have shown no intention to meet halfway and whoever loses out at the end of the day may just throw spammers in the wheel. The situation in Lagos and Kano states, though not in the same mould with others where there are serious infighting, calls for concerns. Both Lagos and Kano are no doubt swing states that any serious contender for the office of president would want to have in his kitty. However, recent happenings show that President Muhammadu Buhari, who won both states in 2015, may face some challenges. For those who are informed about the politics of Lagos, there is growing discontent with the acclaimed National Leader of the APC, Asiwaju Ahmed Tinubu, in the state. Though many have always viewed his seeming stranglehold in the politics of Lagos as an aberration, the treatment netted to Governor Akinwunmi Ambode over his second term ambition, seem to have awakened Lagosians over what they consider the obscene hold of one man over the destiny of many. The APC prides itself as having over 1.7 million registered members in Lagos, but according to INEC, there are about six million registered voters in the state, majority of whom may not be happy with the Ambode treatment. For Kano, one of the states that gave Buhari block votes in 2015, the centre seems unable to hold any longer and the fortunes of the president may just nosedive in the state. This is due to two major factors: One, the return of former Governor Rabiu Kwakwanzo to PDP may hurt the large number of voters the President may hope to harvest in Kano. It is a fact that the Senator has a very large following in the state and his Kwakwansiya Movement is one of the most formidable political movements in the state. The over two million votes recorded by President Buhari in 2015 was due partly to the influence of Senator Kwakwanso, who was then a sitting governor. The former governor left the party with his supporters after a bitter feud with his predecessor, Abdulahi Ganduje, who he installed in office. The political realignment that took place following Kwakwanzo’s exit, will definitely redefine voting patterns in the state. Secondly, the current bribery scandal rocking the present administration in Kano State is another potentially deadly drawback for President Buhari. Governor Ganduje, who promised to deliver five million votes for President Buhari in 2019, was caught on video allegedly receiving bribe money denominated in US dollars and according to reports, amounting to $5 million. He is currently under investigation by a committee set up by the state House of Assembly. To worsen matters, in a state where there has been widespread reports of under age voting with video and pictorial evidences, the services of under age school children were again procured to carry placards at the premises of the House of Assembly in protest against Ganduje’s investigation. This, no doubt, to many, helped in butressing allegations of under-age voting in the state with active connivance with the state government. This latest move, taken together with the damaging bribery allegation, will help direct the attention of the monitoring world to Kano and further hurt the mouthed five million votes by the embattled governor. Whether Okorocha’s estimated five million voters disenchantment will hurt the chances of Buhari or not will be known in a matter of time, except the leadership of the party is able to immediately nip in the bud the growing discontents and put out the raging fire burning under the party’s garment.